After ten years as frontman of the Bedlam Six, Louis Barabbas is writing a musical and Getintothis’ Edward Feery looks back – and forward – at his career. 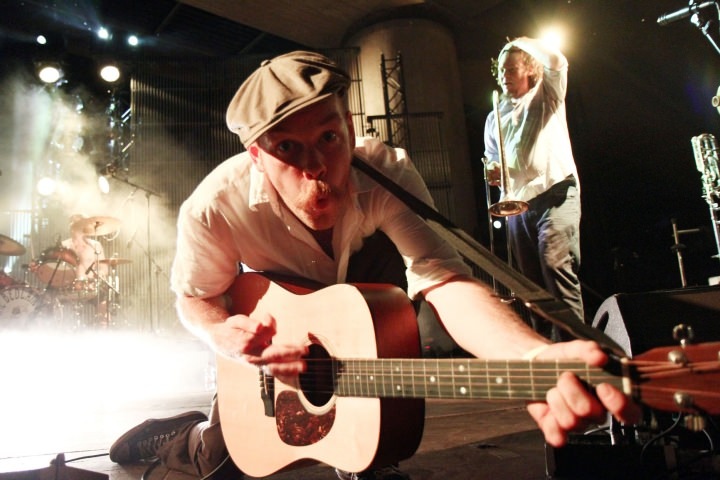 Those familiar with the work of Louis Barabbas will likely be aware he is not the kind quietly to conform to the expected tropes of rock music. Whether performing solo or as frontman of Manchester’s late and lamented dirt-swing septet Louis Barabbas & the Bedlam Six, setting up a record label with a difference in Debt Records or his work with Un-Convention and the Musicians’ Union, his creative output is probably best described as forging his own path and allowing others to do the same. Now, as he embarks on his most ambitious project yet, it seems timely to look back on his career so far. Louis’ first forays into music were as a harmonica player; the list of bands he collaborated with is as impressive as it is diverse, from Sixties perennials Freddy & the Dreamers to politico-punk trio the King Blues. During a stint as fifth member of The Derelicts, he gained the nickname ‘the Bez of blues harp’ for his animated and unpredictable performance habits. A mid-decade stint in Philadelphia proved to be a turning point. Ostensibly over there to study, Louis took the opportunity to throw himself into the east coast underground scene, recording with venerable West Grove genre-mulchers Dr. Dog and watching and learning how bands could develop sustainable careers outside of the mainstream. Returning to Britain and finding himself in Manchester, he formed a group initially known as the Black Velvet Band – where it took, in Louis’ own words, “three years just to get the line-up right”. Many of the faces who passed through the ranks in that time would become mainstays of the Debt Records roster in years to come; his ability to build lasting artistic relationships with a wide variety of people has been a trademark of his career. The ‘classic line-up’, by that point known as Louis Barabbas & the Bedlam Six – the one which would record three albums and tour across Europe five times – would consist of Matthew Cleghorn on lead guitar, Dan Watkins on bass, Fran Lydiatt on keys, Tom Cleghorn on drums, Biff Roxby on trombone and, for some of that time, Ali Cegielka as a co-vocalist. The ethos behind Debt Records harks back to the open and democratic motivations of punk and early indie – of demystifying the industry and making the relationship between fans and bands more egalitarian. In practice, this meant accompanying the aforementioned open-minded attitude to sharing and copying with financial transparency and an encouragement of communication, culminating in the development of ‘open sessions’ where members of the public could come down and watch – and even take part in – recording sessions. The label roster has in the past included several former Bedlam Six members such as Al Baker and Alabaster Deplume, as well as a wide variety of other acts from across the North-West and beyond. While this was going on, the Bedlam Six was going from strength to strength. In the space of five years, they released two albums, two EPs and two live albums/DVDs, as well as embarking on four European tours. The three years of ‘getting the line-up right’ had given Louis the opportunity to hone his songwriting skills, mining a rich seam of subject matter from the unhappy sides of life and populating his songs with characters filled to the brim with all sorts of negative emotions and unpleasant characteristics – “love is filling my heart/the same way water fills a lung”, from Get Religion!’s ‘Hold On To Me’, is a characteristic sentiment. If such a rogue’s gallery was at odds with the zeitgeist of the new decade, there was undoubtedly an audience for something antithetical to the splashy, disposable qualities which dominated the mainstream. The band’s ferocious live shows, and their frontman’s natural tendency to build relationships wherever he goes, galvanised audiences everywhere into a devoted fanbase. Debt Records hosted a stage at the inaugural Threshold Festival in 2011, headlined by the Bedlam Six; the art gallery in the upper reaches of the CUC building proved an ideal showcase not only for the band, but also Louis’ off-and-on-stage exploits, as he skittered around pillars and between punters, still playing his guitar all the while. It was the start of a productive relationship; Debt Records would return to host another stage at the following year’s Threshold. By 2014, the Bedlams were ready for a rest. The crowds were still coming, the gigs were still fun, but five years is a long time to dedicate to any endeavour; some time off, to recharge batteries and take stock, was probably much overdue. So the band announced a hiatus, with the express and explicit concern that this was not the end of the road – not just yet, anyway. The other band members had their own musical projects to work on, in any case. Louis, characteristically, used the break to record a solo album, ‘Gentle Songs Of Ceaseless Horror’, as well as a set of unplugged Bedlam favourites, embark on a house concert tour with labelmate Felix Hagan and start working on another project entirely. A new album was promised, packed with live favourites. Another European tour followed, barely troubling the music press but playing sold-out shows most nights. Their cachet as ‘the next big thing’ might have faded, but their ability to galvanise a crowd remained undimmed. As such, it was something of a surprise when news of the official release of the new album, Down Down Down, was accompanied by the announcement that the Bedlam Six were calling it a day. But Louis Barabbas is not the sort to let himself get worked into a rut; the band were clear they wanted to go out on a high, before the lustre could fade entirely and they risked falling into the friendship-corroding routines that tear apart so many touring bands. 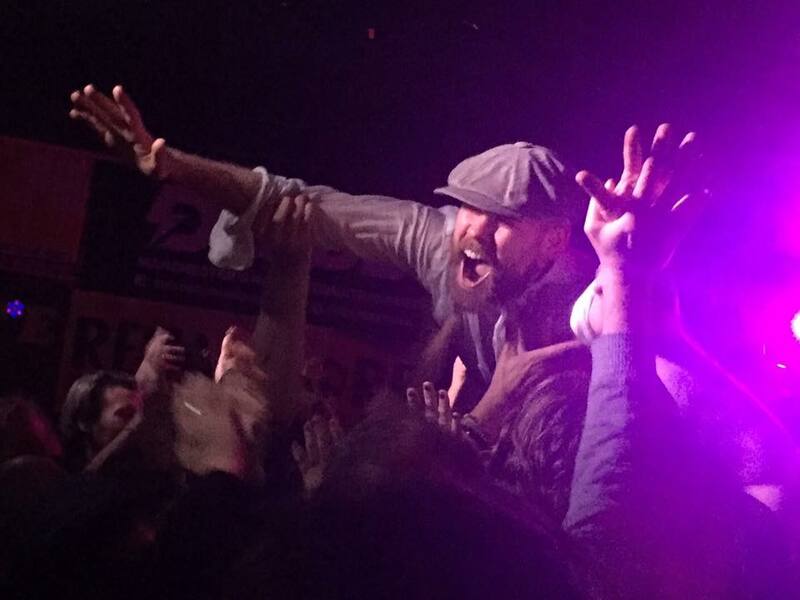 The album’s official launch party was also a triumphant farewell at Manchester’s Ruby Lounge, culminating in Louis crowdsurfing around the packed venue, the adoring crowd supporting his journey across the room – a final image the man himself would doubtless find fitting. So, now he is no longer in a band, what now for this enduring figure of the North-West underground? Well, there is his continuing work as a board-member of Un-convention, an organisation dedicated to encouraging conversations about the future of grassroots music; his work with the Musician’s Union, where he sits on three committees (Live Performance, Writers, and North Regional for those keeping score); his monthly column for the resurrected Sounds Magazine; his contributions as a moderator for Tom Robinson’s Fresh On The Net, helping in the hunt for the best new music out there; and, of course, the continuing work of Debt Records. But it’s not likely the man who spent ten years throwing himself around stages across Europe and further afield would just fade into the background. For the last three years – since the Bedlams’ hiatus – alongside everything else, Louis has been working on a musical – and now, with Arts Council England funding, he is releasing a soundtrack and preparing a showcase of songs later this month. 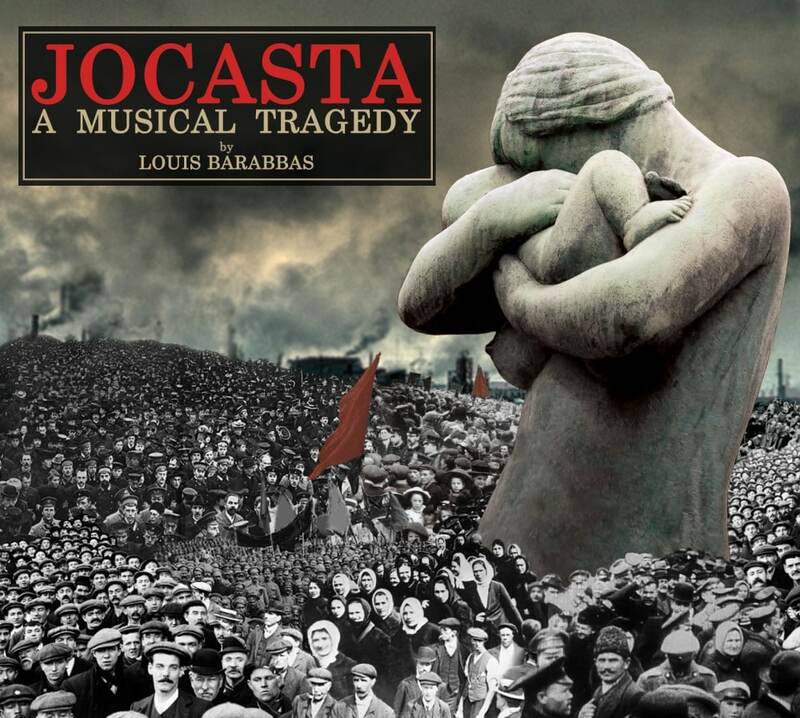 Jocasta: A Musical Tragedy takes the myth of Oedipus and transports it to the tempestuous times of 1920s Europe, set amid the birth-pangs of tabloid journalism, the death-throes of a tyrannical monarchy and the bloody chaos of popular uprisings. The main character, however, is not Oedipus himself, but his mother Jocasta, rescued from the sidelines of antiquity and recast as a woman at the centre of “the most tumultuous of emotional journeys”, as Louis put it in an article about the myth on his website. Obviously, it’s not a straight transposition of the myth; rather than ancient Thebes, the story takes place in the fictional Kingdom of Patrida – a sort of despotic, landlocked, interwar Britain. The soundtrack album is a riot of voices and players from across the Debt roster and beyond; Bridie Jackson takes the titular role, while Louis plays her brother and duplicitous advisor, Robert Creon (Oedipus – or ‘Caliper Lee’, as he is in this version – doesn’t get so much as a line to himself on the soundtrack, mirroring how the Ancient Greek playwright Sophocles marginalised the character of Jocasta). The most surprising thing about this musical, however, is something nobody could have foreseen at the time of its conception – how, with the rise of figures like Donald Trump, Marine Le Pen and Rodrigo Duterte, and the political fallout from Brexit, Jocasta’s tale of conniving politicians, entitled rulers, corrupt governments lining their own pockets, and revolution ending in bloody failure feels so much a product of its time, like a funhouse-mirror version of Hamilton where the politicians scrabble around vermin-like in their venality rather than bestriding continents like colossi. After a career spent happily at odds with the mainstream, perhaps the zeitgeist has finally caught up with Louis Barabbas.